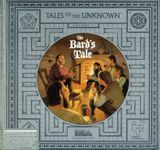 The Bard's Tale is a fantasy computer role-playing game created by Interplay Productions in 1985 and distributed by Electronic Arts. It was designed and programmed by Michael Cranford. It was originally released for the Apple II, and was also ported to the Commodore 64, Apple IIgs, ZX Spectrum, Amstrad CPC, Commodore Amiga, Atari ST, MS-DOS, Apple Macintosh, and NES platforms. The Bard's Tale is a straight forward "dungeon crawl". The objective is to gain experience and advance characters' skills through (mostly) random combat with enemies and monsters. This is done while exploring maze-like dungeons, solving occasional puzzles and riddles, and finding or buying better weapons and armor. When beginning the game, the player may create up to six player characters, chosen from among the following classes: bard, hunter, monk, paladin, rogue, warrior, magician, and conjurer. The classes sorcerer and wizard were available to experienced conjurers and magicians. Source: Wikipedia, The Bard's Tale (1985 video game) , available under the CC-BY-SA License.